Call us or use the form below to send us your questions! 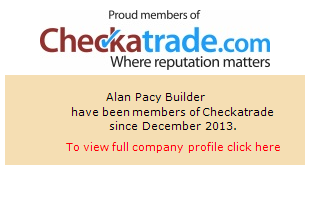 Alan Pacy has been a professional builder for 34 years. His continuing work is testimony alone to his success and incredibly high standards of workmanship. A. Pacy do not undertake any plumbing or electric work - we leave that to the professionals in their own respective fields. Please contact us if you would like us to recommend anyone to you. Although based in Ferring, Worthing, West Sussex, A. Pacy Builders will come to you wherever you are in the Sussex area. Copyright © 2014 A. Pacy Builders. All rights reserved | Site designed by Creative.